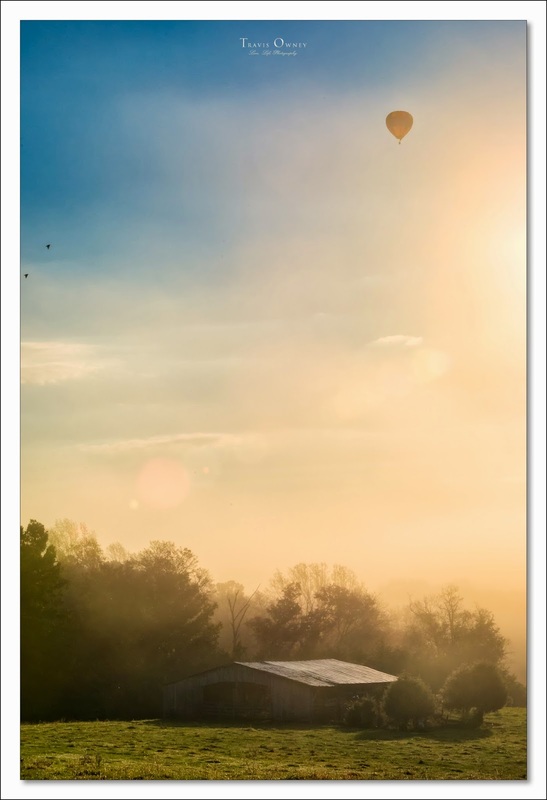 Since I arrived in Charlottesville, one of the photographs that was high on my list was of hot air balloons. They are fairly common yet elusive in this area. On 4 occasions I have spotted them floating lazily on the horizon but either the time of day was wrong or the location did not work. About a week ago I wasn't pleasantly surprised when Conner came flying downstairs yelling my name and pointing to the sliding glass door. I was surprised to see a half dozen balloons drifting over our backyard. There was a thick fog covering the pasture. My vision of balloon photos was that of big colorful designs pressed against a beautiful backdrop. The circumstances of the event led me down a more muted path to a photo that I really love. I have a couple of other images with multiple balloons but I preferred the added dynamic of the hawks flying in from the left and a touch of lens flare on this one.